You can now quickly resize your Amazon Redshift cluster in minutes by adding nodes to get better performance and more storage for demanding workloads or by removing nodes to save cost. Elastic resize is significantly faster than the Classic resize operation, which Amazon Redshift has had since its inception. Additional nodes are added or removed in minutes with minimal disruption to on-going read and write queries. This enables you to quickly size up for faster performance and size down when the job is complete to save cost. While Elastic resize is the ideal approach for adding or removing nodes, Classic resize can still be used when you need to change the node type. Additional nodes that are not covered by existing Reserved Instances (RIs) are charged at the on-demand pricing rate in that region. To learn more, visit the Amazon Redshift pricing page. 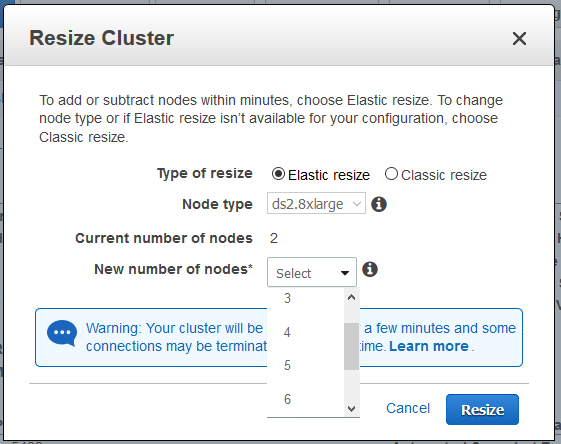 Elastic resize is not available for DC1 node types. To use elastic resize, please migrate to DC2 for free. You can resize using the AWS Management console or programmatically using the AWS CLI or API. To learn more, see Resizing Clusters in the Amazon Redshift Cluster Management Guide. To find out more about how Elastic resize works, when to use it, and how to size your clusters, please watch the AWS Online Tech Talk: Best Practices for Scaling Amazon Redshift. Elastic resize is now available with the release version 1.0.4852 or higher in all AWS commercial regions. Refer to the AWS Region Table for Amazon Redshift availability.